By many metrics, Scar City could be called a utopia. Debilitating injuries, both physical and mental, are easily cured, and disease is virtually a thing of the past. All of mankind's natural predators have been extinct for hundreds of years, and old age has become not just preventable, but reversable. As it turns out, the only thing left to kill people is, well, people. 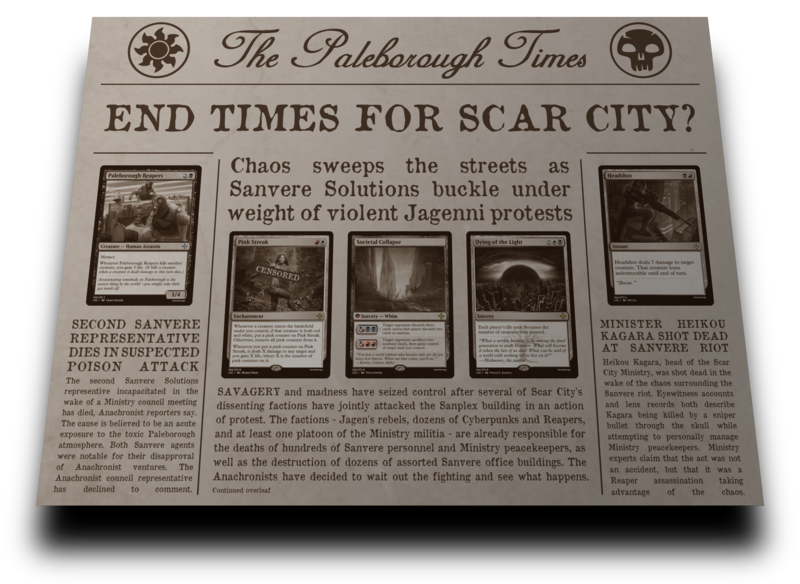 Like Jagen's rebels, the " style="max-width:100%;"] Reapers of Chaos aren't happy with how Scar City is run. 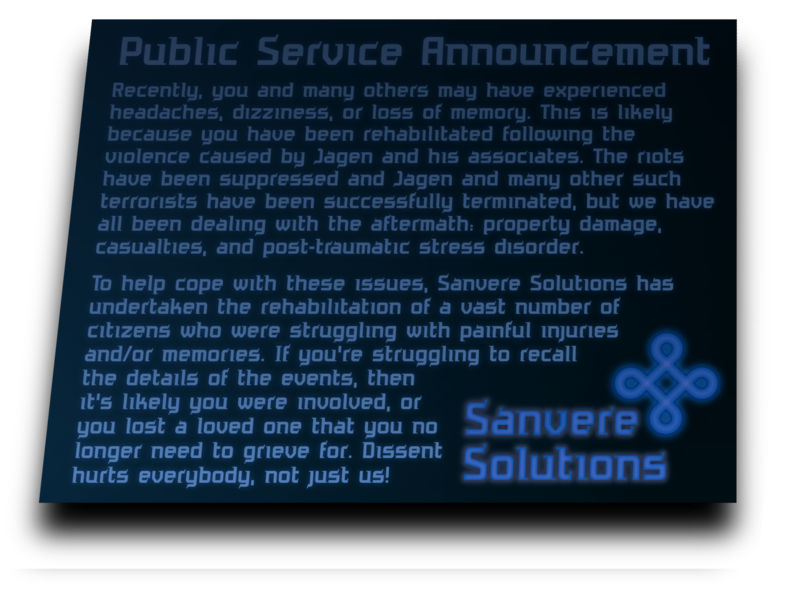 But rather than with Sanvere, their fight is with the Ministry, which the Reapers see as weak, bureaucratic and deeply flawed. 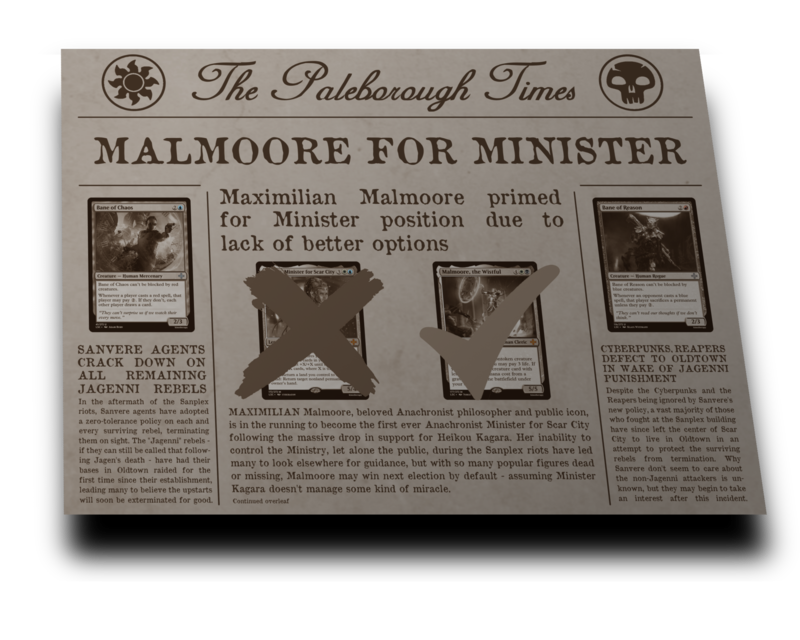 The Reapers don't want to take over the Ministry, though; rather, each Reaper wishes to tear down the existing system so that can they can live individually by their own rules, with nobody telling them what to do. To this end, the Reapers band together and wreak havoc in the city, with their methods of reaching their goals being just about as subtle as those goals themselves; they'll kill anybody who gets in their way. "Kill" works pretty similar to "dies", it's a descriptive term that mostly appears on triggered abilities. It usually takes the form "Whenever ~ kills another creature," which you can read as "Whenever another creature dealt damage by ~ this turn dies." In practice, kill triggers play similarly to death triggers and Enrage triggers, as well as keywords like first strike and deathtouch: it's a way of saying "Don't get in my way." But if your opponents aren't blocking, then how do you fight people? Do you sit around and let them attack you so that you can block? Nonsense! Living in Scar City has many cards you can use to either force fights or to use as combat tricks to punish your opponents for risky attacks/blocks. It's also worth noting that " style="max-width:100%;"] gets some of the biggest creatures for their mana cost (often undercosted fatties with drawbacks) meaning that fight spells will be extra useful with them. In addition to the three new cards below, you can also look to the previously revealed Dropkick, Choleric Whim, and Ambush Rider to get some cheap Kills. 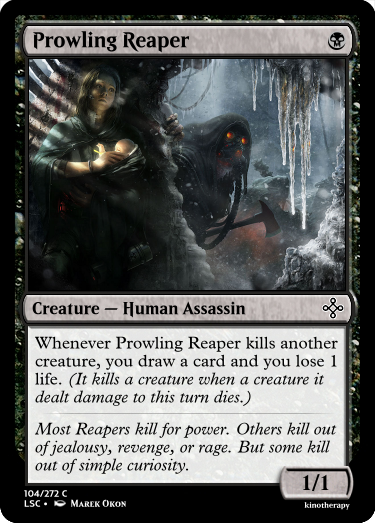 I don't really have much more to say, but that's fine since the Reapers are much more about action than words anyway, so here are six more cards that use the "kill" mechanic. Yes, white has "uses its enemies' keywords negatively" as a theme in this set. Not sure why. "Kill" is a descriptive term. A source "kills" a creature when that creature dies if that source dealt damage to that creature that turn. Whenever a creature dies, each source that dealt damage to it that turn "killed" that creature, not just the last source of damage. If any of those sources have an ability that triggers upon killing a creature, those abilities trigger simultaneously. If two creatures deal lethal damage to each other simultaneously, then any abilities that trigger upon killing a creature still trigger. Those creatures leave the battlefield before those abilities resolve, so they won't be affected by the resolving abilities. If they were controlled by different players, the player whose turn it is will have their ability resolve last. 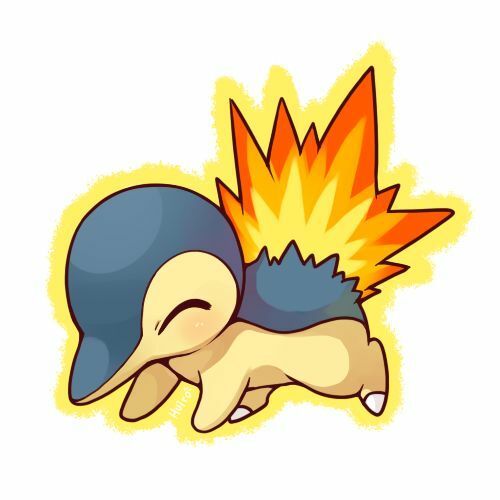 If one creature has an ability that triggers when it kills a creature, and a second creature has an ability that triggers upon dying, and the first creature deals lethal damage to the second, both abilities will trigger simultaneously. If they're controlled by different players, the player whose turn it is will have their trigger resolve last. It seems that everybody's had a bone to pick with Sanvere recently. The Cyberpunks — a collective name for all of the young, bright-eyed hopefuls of Scar City who either do brilliant things or buckle under the weight of their own potential — are the latest group to tangle with the sinister corporation, but why? The Cyberpunks are obsessed with technology, including everything made by Sanvere, so why can't they get along? 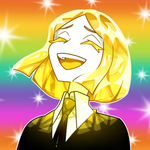 The answer is that Sanvere's motto of working towards a brighter future is a blatant lie. The technology they produce comes with harsh restrictions on its usage, which the Cyberpunks detest, and any unapproved ventures are quickly shut down by the peacekeepers under Sanvere orders. The company is pushing Himidor towards a future, certainly: a future perfectly suited to favour them and them alone. The Cyberpunks are not as selfish, but nor are they any more noble; they simply wish to work for the future, just for the future's sake. Futuristic is less of a mechanic and more of a grouping of card types is quite familiar with: instants, sorceries, and artifacts matter. 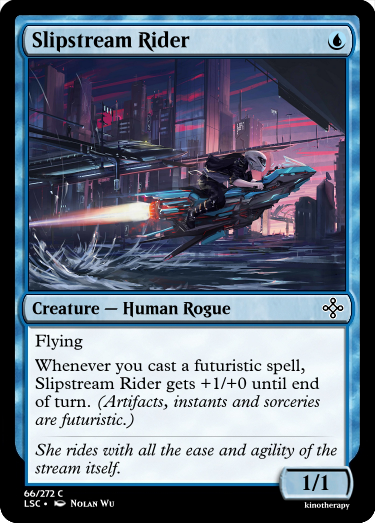 Like with historic in Dominaria, "futuristic" appears in a number of different ways, but it commonly features as a cast trigger much like the prowess-lite ability on Slipstream Rider. 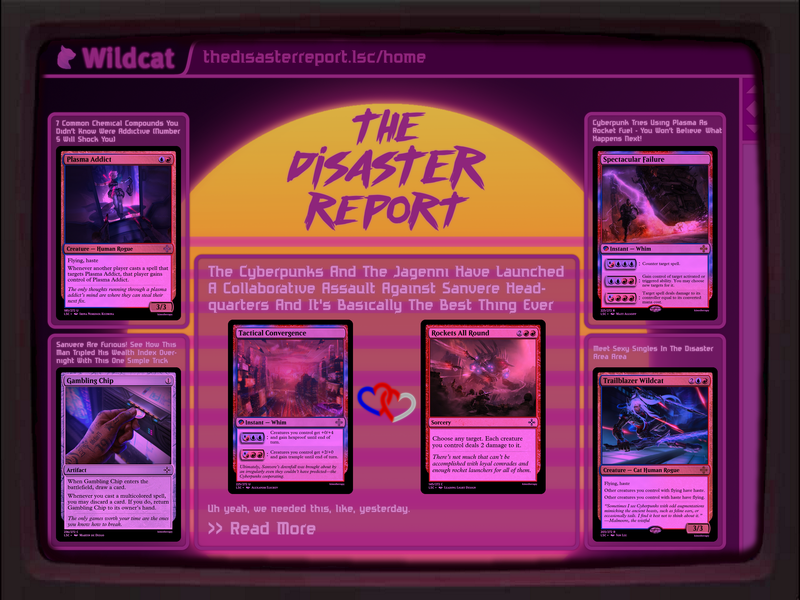 Decks with both spells and creatures that care about spells will usually have a balance of each; similarly, you'll generally want a healthy mix of futuristic cards and cards that care about futuristic cards in your deck. There have already been lots of options for futuristic cards, cards such as Gambling Chip, Mercurial Whim, and Spectacular Failure. But why not both? 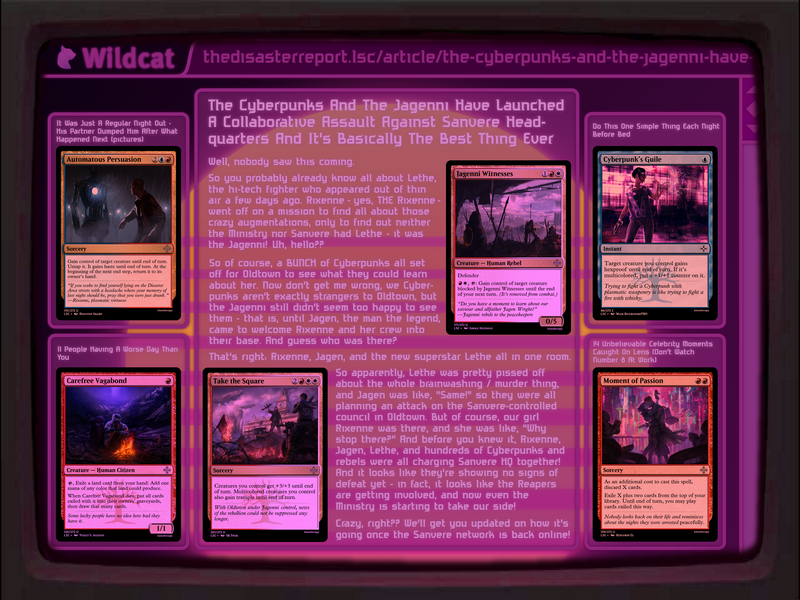 Finally, here are the Cyberpunks on the graveyard shift. 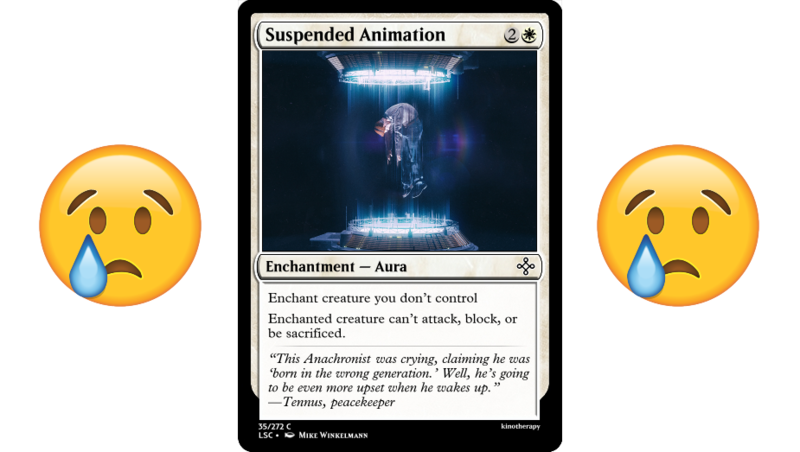 Get the best use out of them by playing them after your instants and sorceries and after your artifacts that sacrifice like Slipstream Portal, or use them after discarding futuristic cards to the likes of Gambling Chip, Cerebral Programming, or Moment of Passion. 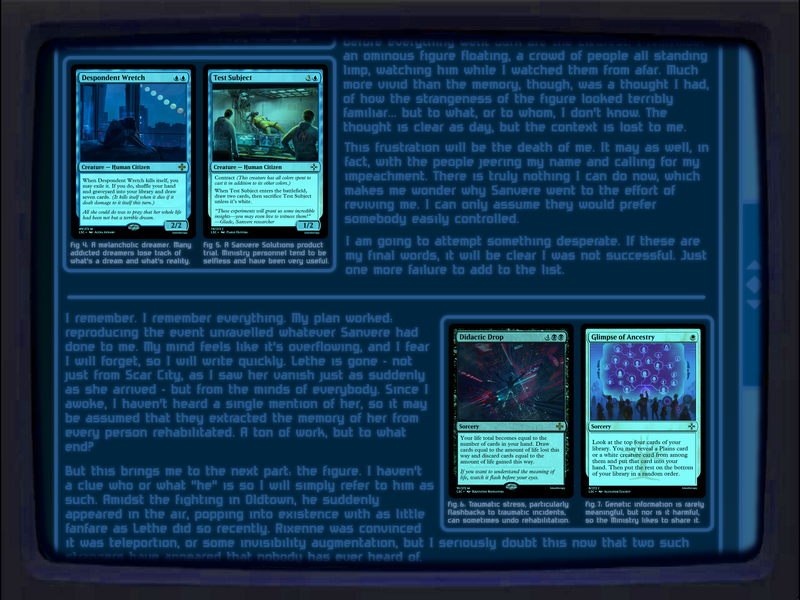 Futuristic is a game term that refers to a card that has the artifact, instant, or sorcery card type. futuristic than another or provide an additional bonus — an object either is futuristic or it isn't. Some abilities trigger "whenever you cast a futuristic spell." Such an ability resolves before the spell that caused it to trigger. It resolves even if that spell is countered. An ability that triggers "whenever you cast a futuristic spell" doesn't trigger if an artifact card is put onto the battlefield without being cast. One card (Antipode of Scar City) cares about nonfuturistic cards aswell as futuristic cards. Nonfuturistic cards are cards that aren't futuristic, not just cards that have card types other than artifact, instant, or sorcery. For example, Techtongue Replicant doesn't count as nonfuturistic because it's an artifact, even though it's also a creature. Yes, artifacts are both historic and futuristic. Don't think about it too hard. korakhos: 💖💖💖 Thank you! I hadn't even considered entering the set into any kind contest, but I may have to with this kind of reception.. Finally, we have the Anachronists. What's their deal? Nobody seems to understand them or what they're up to, and they never really get involved in the conflicts that seem to be gripping the rest of the city. The reason is that there's something else they care about, that none of the other groups seem to acknowledge: the death of the natural world. Accepted as an inevitability by everyone else, the Anachronists can't help but note the correlation between nature's decline and the rise of plasma-based technology, leading them to find the modern world somewhat... lacking. They don't despite Sanvere for their implied involvement, but rather they understand that humanity has only survived this long at the cost of every other living thing. Billions and billions of lives sacrificed just to ensure the survival of a fraction of them; what difference does the sacrifice of a few more make? If you've visited this thread today eager to see Living in Scar City's 8th custom keyword, I'm afraid you're going to be disappointed: it's an evergreen keyword instead! It's fitting that the old-fashioned Anachronists would prefer to stick with the familiar, since much like how the Cyberpunks are obsessed with the future, the Anachronists are fixated on the past, with mourning the lost and exploiting them. Sacrifice outlets are all well and good, but they won't do much without someone to sacrifice. An ethical dilemma to be sure, but luckily there are some particularly morbid folks that make this decision much easier on you. 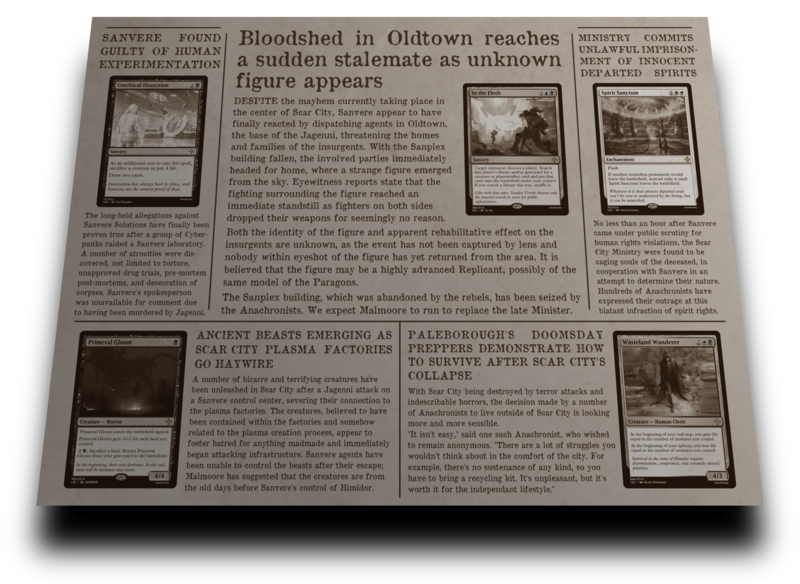 And here are some more sacrifice pay-off cards in forms other than creatures, except for the one that is. 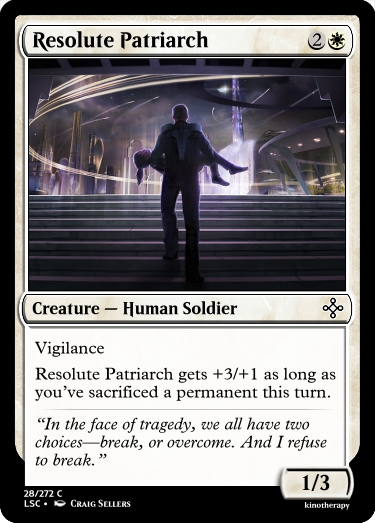 You can get extra use out of cards like these and Resolute Patriarch with cards that sacrifice themselves, such as Anachronous Cathedral and Remorseful Militant from a few days ago. I had actually actually considered it, but I felt at though it would be too rarely used for evergreen, and it doesn't trigger too often under normal circumstances. 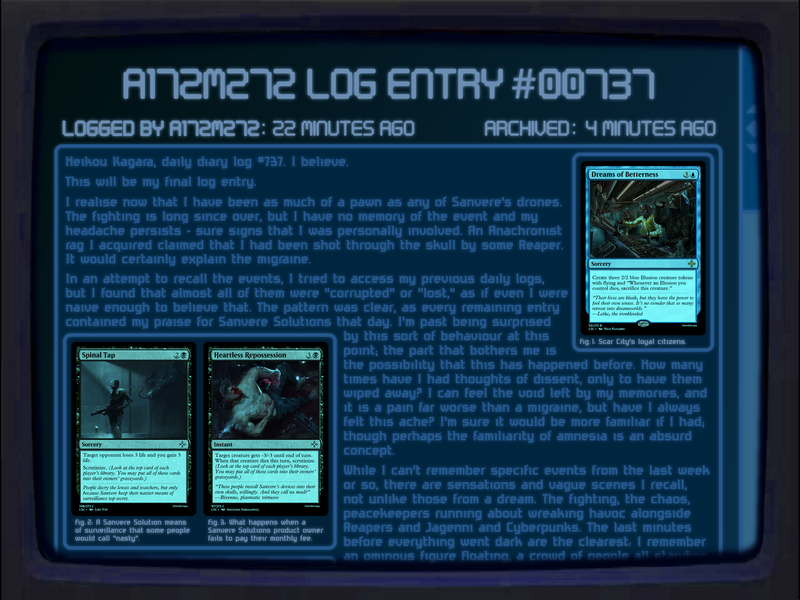 The version I had before that was pseudo-text (which apparently has already been done by other MSE users?) so if I iterate on the set at all then I might switch to that version. 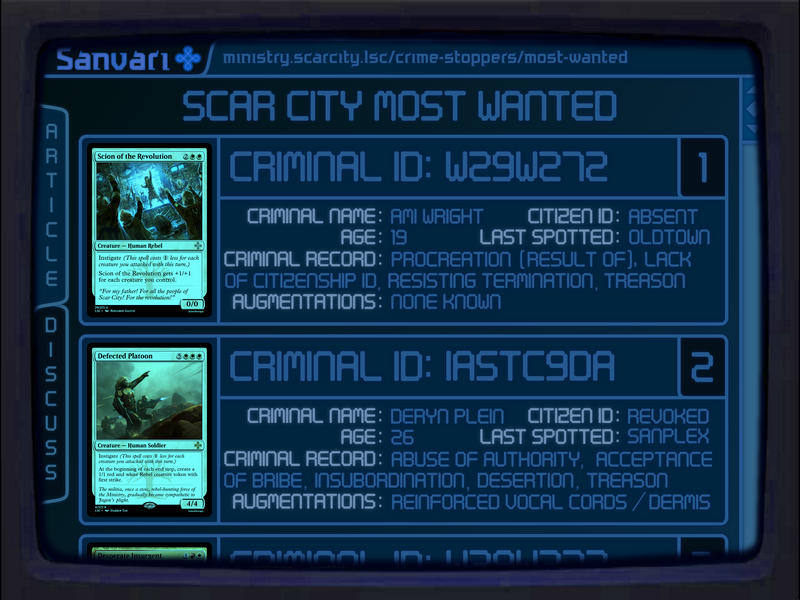 Living in Scar City Complete contains the set file in its entirety, Contract and Whim cards included, plus the templates required to open the file and use those frames. 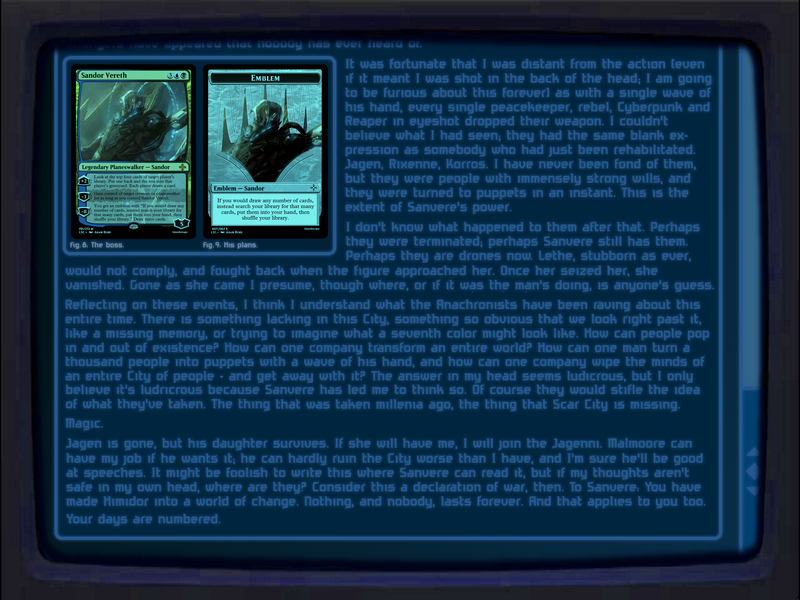 Living in Scar City Basic has the Contract and Whim cards replaced by M15 Mainframe versions, which requires no additional templates. They look pretty bad, though. Both files require M15 Mainframe, Mainframe Tokens, Mainframe Walkers, and Cajun Style Emblems, all of which you can grab from Cajun's Mainframe Pack in this thread if you haven't already. For everybody who followed the spoiler thread for Living in Scar City, thank you! And for everyone who hasn't followed it at all and just clicked on it because it said Set File, thank you also! 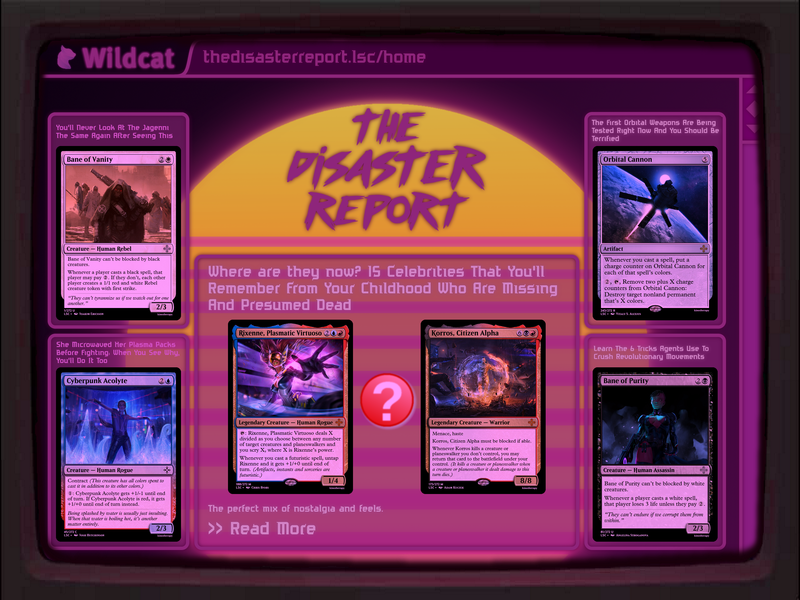 If you have any more feedback about the cards, spoilers, or set in general — positive or negative — I'd love to hear it. With this being both my first set and my first spoiler thread, it will be nice knowing what went well and what didn't so that I can use that to help with whatever I wind up working on next.